Electronic Arts announced its Q4 and fiscal year earnings for the year ending March 31, and the digital sector was really good to the company. During the call to investors this evening, EA reconfirmed the new Battlefield game will release in Q3 of this year, and Bioware’s Anthem in Q4 which ends on March 31, 2019. Battlefield 5, as we’re calling it at the moment, will feature a new mode that’s unique and brings new challenges, and it will contain multiple maps and modes for multiplayer, and a single-player campaign. It will also feature ongoing services beginning from launch like Battlefield 1. Whether “unique” pertains to Battlefield 5 featuring battle royale as rumored or the prone mechanic wasn’t noted. When it comes to Anthem, every dimension will offer “something new” whether it be stories and co-op and it will feature constantly evolving gameplay and “it’s a fantastic social experience,” according to Wilson. Anthem will also be designed around player input. 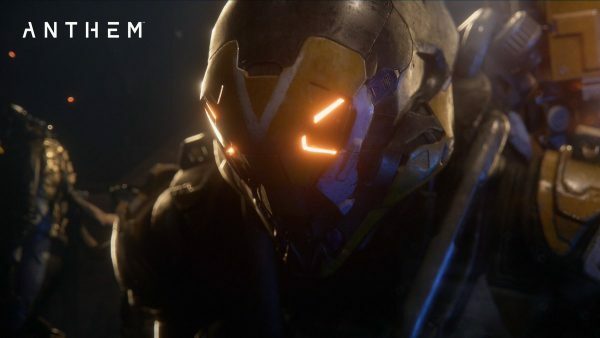 “Every dimension of [Anthem] will offer something entirely new for a wide audience of players – from a new universe with unique stories that BioWare is creating, to the cooperative gameplay, to the epic and beautiful environment that constantly evolves around players,” said Wilson on the call to investors. “Anthem is a fundamentally social experience, and we will open new ways for fans to join the community and play early, enabling us to shape and refine the game with their input and feedback. EA also said it expects the install base for PS4 and Xbox One to reach 130 million – up from the current 103 million – and Switch to hit over 30 million by the end of the calendar year. It expects the PC market to be flat. “Turning to our expectations for fiscal 2019: we expect sales of current generation consoles from Microsoft and Sony to continue to be strong, with the installed base growing to 130 million consoles by the end of calendar 2018, from 103 million at the end of calendar 2017,” said CFO and COO Blake Jorgensen in the prepared remarks. A Way Out had close to 2 million players as of the end of the quarter, the firm noted on the call. EA announced last month the game had sold over 1 million units in less than a month. The Battlefield community, across current generation consoles and PC now has over 54 million players life-to-date. EA also called attention to competitive growth in EA Sports titles, specifically calling out the FIFA and Madden franchises. Per the figures, 18 million players engaged in “competitive gaming” across FIFA 18 and Madden NFL 18, up more than 75% year-over-year (yoy). In total, EA Sports franchises grew to nearly 90 million players on current generation consoles life-to-date. Information on FIFA 19 will be announced during EA Play in June. Fiscal year 2017-18 was a good year for The Sims too: there are now over 80 million Sims players across PC and mobile as of fiscal year end. 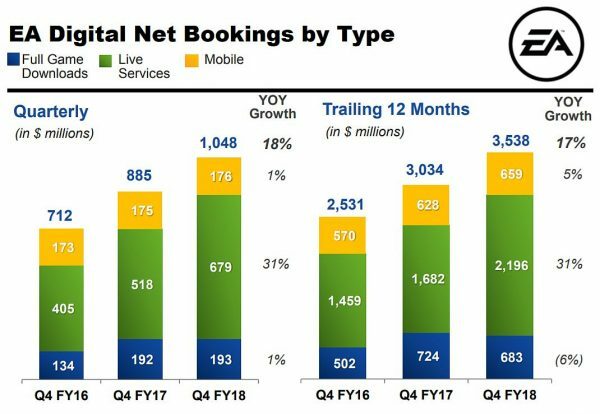 EA reported 17% growth in digital net bookings for fiscal year 2018 of $3.538 billion. The figure represented 68% of total net bookings, up 7% from the prior fiscal year. Net bookings is products and services sold digitally or sold-in physically in the period. Net bookings is calculated by adding total net revenue to the change in deferred net revenue for online-enabled games and, for periods after Q4 fiscal 2018, mobile platform fees. Live services, which accounts for DLC, and other digital only properties, were record $2.2 billion. For Q4 for the 2018 fiscal year, EA reported $698 million in net bookings for consoles – up 38% yoy. PC was up 11% to 174 million yoy. When mobile is factored in, $1.048 million was earned for the quarter. If you look over the slides above and below, you’ll see the majority of the firm’s revenue came from digital sales – up 31% over Q4 2017. Physical sales were flat year over year, with a slight uptick for the full year. In all, digital net revenue for Q4 was $1.1 billion, and packaged goods were $480 million, for a total of $1.6 billion in net revenue. Broken down for the fiscal year, EA reported $697 million in net bookings on PC, a 1% increase. 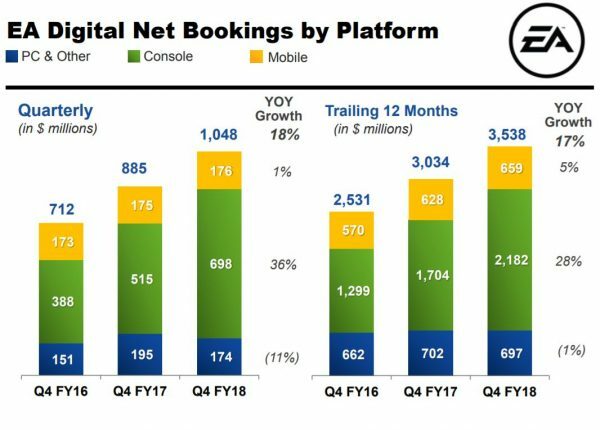 Console net bookings were $2.2 billion, which is a 28% increase yoy. For the 12 months ending March 31, 2018, digital net revenue was $3.5 billion, packaged goods and other net revenue $1.7 billion, with total net revenue $5.2 billion.